Is it Verizon's turn to join media merger mania? Will Verizon join media merger mania? Disney and Fox. Comcast and Fox. AT&T and Time Warner. America's media titans are scrambling to combine so they can stay competitive in an ever-changing industry. But there's one major name that has yet to join the latest round of merger madness: Verizon. 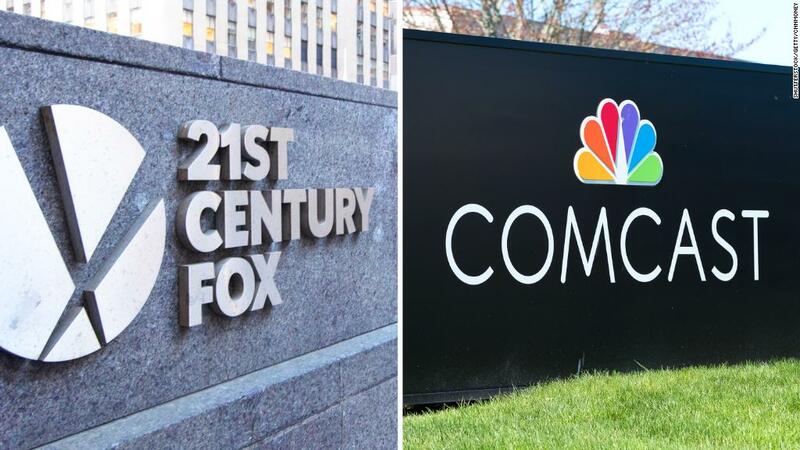 Unlike rivals AT&T (T) and Comcast (CMCSA), the telecom giant hasn't made a public play for a major media company this year. Verizon (VZ) says that's by design. "I'm not going to say never on anything," Chief Financial Officer Matthew Ellis told investors in late April. "But when I look at it right now and in the foreseeable future, I don't see there being the right time to jump in." Many large media and telecom companies think merging is the key to survival. It's in part a response to Google (GOOG) and Facebook (FB), which both have a strong grip on the digital advertising marketplace. Related: Is Comcast's Brian Roberts outflanking Disney's Bob Iger? TV networks and movie studios have also been rattled by new competitors like Amazon (AMZN) and Netflix (NFLX), which now carry myriad options for video content. Those internet companies have built formidable distribution platforms that they can use to deliver shows and movies directly to customers, making them less reliant on traditional distributors, too. That's why traditional media companies feel pressure to scale up: If they can control content and distribution, like Netflix, they can potentially form platforms that will insulate them from cord cutting. John Hodulik, a telecom analyst at UBS, said it seems Verizon wants to use its existing assets to find success. Most of its operating cash flow comes from its wireless business, and Hodulik said the company is focused on 5G, a new wireless technology that will make our electronics faster and more reliable. He added that Verizon does have interests in media, but its stake is in online content, not traditional broadcasting and film. It owns Oath, the parent company of AOL and Yahoo. Hodulik said Oath has high hopes for digital advertising. Walter Piecyk, a telecom analyst at BTIG Research, said that Verizon's existing investments in new media make it a different kind of company than its rival AT&T. The US Justice Department sued to block AT&T from buying Time Warner (TWX), the parent company of CNN, Warner Bros. and HBO. A ruling in that case is expected by next Tuesday. Unlike AT&T, a legacy media company wouldn't necessarily be a natural fit for Verizon, whose FiOS TV service is far smaller than AT&T's U-Verse and DirecTV. Instead, Piecyk thinks a platform like Twitter (TWTR) would make more sense for Verizon. Other factors might also have contributed to Verizon's merger apathy, he added. For example, Sprint and T-Mobile have agreed to combine — a union that would reduce competition and put less pressure on Verizon to please investors with big transactions. Although Verizon benefited big from last year's tax cuts, it may have other plans for that cash, Piecyk noted. "All that additional money that they are getting from the tax savings is ultimately going to be used to fund dividend growth for investors," he added. "Large acquisitions, whether it's media or otherwise, can tend to disrupt their ability to do what drives the stock the most, which is continue to pay the dividends." Both analysts noted that Verizon could ultimately change its mind. It was rumored to have recently considered a traditional media purchase: The company approached Fox about a potential acquisition last year, though nothing ever materialized. Deadline and Reuters also reported that Verizon once expressed interest in Lionsgate and CBS. "People believe that they are sort of hanging around the hoop, just in case there are some attractive assets that they can acquire on the cheap" that could feed the company's advertising strategy, Hodulik said. The whims of the top brass could change, too. Although Verizon CEO Lowell McAdam has been adamant about staying out of big media, he just turned 64 and is nearing retirement age. "That's the current stance," Hodulik said. "We'll see what the next guy thinks."